Whether it be lemons or limes, oranges or tangerines, there seems to be a type of citrus for everyone. Even if the taste of the fruit doesn't get you, the optimistic, energizing smells and fresh colors of a citrus tree are a cheerful addition to any garden. The many varieties of citrus have slightly different growth requirements, but all have the same basic nutritional needs. Boron, though often overlooked, is a nutrient that is necessary for proper tree functioning. Plant growth depends on adequate uptake of nutrients. There are 17 nutrient elements that are considered essential for plant success. While three of these, carbon, hydrogen and oxygen are pulled from the water and air, the other 14 are absorbed through plant roots. Nutrients are categorized by the relative amounts required. Primary and secondary nutrients are measured as parts per 100, while micronutrients are measured as parts per million. The primary nutrients are nitrogen, potassium and phosphorus. The secondary nutrients are calcium, magnesium and sulfur. The micronutrients are boron, chlorine, copper, iron, manganese, molybdenum, nickel and zinc. Boron plays a role in differentiation of growth cells, regulation of carbohydrate metabolism and movement of calcium. Deficiencies in boron have become more common in areas where there is intensive cropping. Though boron is supplied in small amounts, it is needed in continuous supply at growing points. Deficiency symptoms are death of terminal growth; thick, curled, wilted, chlorotic leaves; soft, dead spots on fruit and reduced flowering. High levels of boron can produce yellowing of leaf tips and margins, eventually causing leaf death. Citrus trees and rootstock vary slightly in how they are affected. 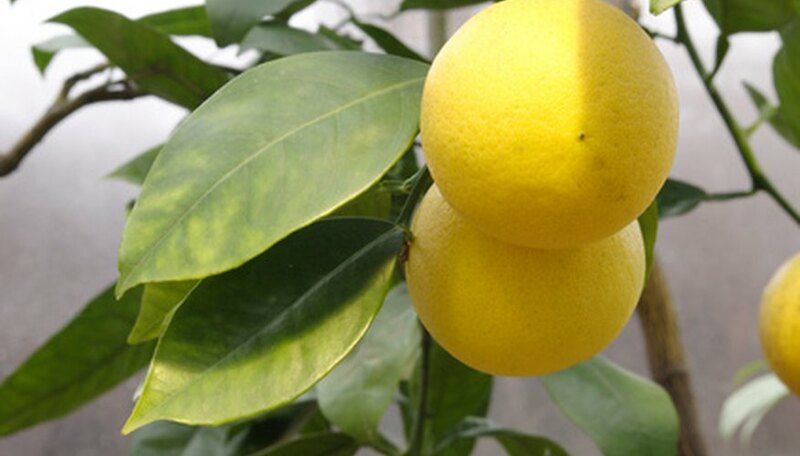 For example, lemons and grapefruits tend to have a greater reaction to excess boron than orange trees. Boron toxicity is noticeable on the older leaves first. Drying and chlorosis begins in the center, between the leaf veins, and progresses as more boron accumulates in the tree. Irrigation methods, as well as mineral content of the water itself, affect boron levels in citrus. Boron is taken up through the root system of the plant. If the tree is watered insufficiently, nutrients will not be able to move through the soil to the root area. On the other hand, boron is not prone to leaching, so it is less likely to be lost through overwatering. Boron in the water can present a problem. Toxic levels are sometimes found in well water or springs. Deficiencies occur most often where there is low boron in the soil and in the water. Boron toxicity can be remedied by the application of nitrogen fertilizer as calcium nitrate. Boron deficiency is easily correctable with the addition of boric acid or borax. A complete fertilizer, applied in correct amounts and at an optimal time of year when trees are able to benefit most is recommended.